"Noah benShea is a compass because he has with wisdom, compassion, and humor helped so many of us find our way. He is like a Zen Mark Twain." "Noah benShea is a wise and compassionate man. His writings have touched me deeply. I highly recommend his work." "The insights in Noah benShea's work will benefit and transform all those who read it." During these tough times in people's lives, The Journey To Greatness with Noah benShea is a wise and heart-warming reminder that things don’t have to be good for us to be great. Greatness is not a destination, but how you travel; it’s within you, and within your grasp. 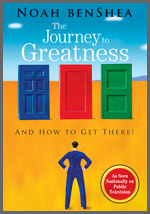 In this book, you will find a road map that includes all you need for your journey to greatness. Author Noah benShea shows us how lifelong learning and a commitment to self-improvement through venues such as communication, caring, character, and peace can make all the difference. He celebrates this excursion while providing insightful and inspirational messages, life-changing lessons, and a personalized notebook that will make the work of getting to greatness a labor of love. Understanding yourself, holding yourself in high regard, and choosing to pursue the greatness that lies within are the first steps on a journey that you will travel your entire life. As benShea reminds us, "Over every finish line are the words, 'Begin Here!'"